Delivering lower cost of ownership. Our all-new Canter® Series commercial trucks redefine everything you want in a business vehicle. They’re designed to deliver lower cost of ownership than competitive trucks. For example, a Canter gets more than 8% better fuel economy than an Isuzu. It also goes further than an Isuzu between service intervals. It even carries up to 2,200 pounds more payload than an Isuzu. Canter work trucks will change the way you think about moving your products and business forward, with cost of ownership so low you can measure it by the mile. In fact, if you drive as few as 20,000 miles annually, a properly driven Canter can move several thousand dollars to your bottom line in operating cost savings in just three to four years. And it’s just getting started. Imagine how far its dependable performance and lower cost of ownership can take your business. In testing it delivered 8.45% better economy than an Isuzu NPR-HD commercial truck, and improved to 13.8% better when the Canter’s ECO mode was engaged. A Canter work truck gives you a service advantage too — with longer maintenance intervals than Isuzu. A payload advantage — with up to 2,200 pounds greater payload capacity than Isuzu. And a warranty advantage — because our industry-best 5-year/175,000 mile powertrain warranty covers not just the engine, but the entire powertrain as well. Visibility: Panoramic windshield and side windows, large side-view mirrors. Maneuverability: Tighter turning radius than a MINI Cooper. Small displacement/high-performance: 4P10 diesel, compact 3-liter design with 2-stage turbocharger, Piezo injectors for high torque and fuel economy. Better transmission solution: Duonic® 6-speed automated manual type eliminates torque interruption between shifts and features ECO Mode for higher fuel efficiency. 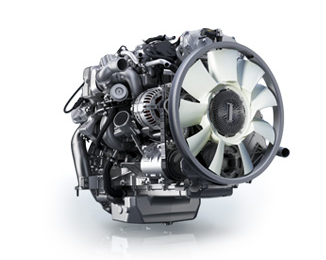 BlueTec® Strict emission compliance while improving fuel efficiency; no engine tuning compromises required. New frame Lighter-weight frame, more load capacity, easier body mounting. Ultra-high-capacity cooling system Dramatically improved airflow around it and the engine. Parking In Park, parking gear locks vehicle in place. Rear suspension Boxed hangers for added strength.